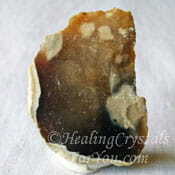 Soul star chakra stones help the area where we connect with our higher self, and through this develop spiritual abilities. This chakras meaning is a lot about the idea of 'letting go'. It relates to allowing the Divine light of Spirit, and the white ray to fill your life and this energy encourages you to let go of old attitudes that may otherwise have held you back in your current life. The soul star chakra is associated with the origin of enlightenment and with the principle of ascension, and to the ideal, 'I transcend'. It is via this chakra that specific information is downloaded, to the chakras below. One of the reasons we do not normally have access to this information, is that it may also be quite confronting. If you succeed in gaining this information, it may be powerful to aid you to make momentous changes in your way of thinking and living. This may happen when you integrate lessons that you learned in prior lives. The eighth chakra is commonly called the soul star chakra or seat of the soul. It is located above the top of the head, above the crown chakra. This chakra is situated above the highest point of the physical body, and is approximately a hand width above the head, or around six inches, and up to two feet in some people. It is the first transpersonal chakra. It is sometimes called the seat of the soul, as it is the point where spiritual energy, and Divine love, enters the body. Although there is a gateway between it and the crown chakra, commonly called the Stellar Gateway, this is the next chakra above the crown chakra in the etheric body. Via the gateway, Divine light and energy filters down into the crown chakra for distribution throughout the body. The eighth or soul star chakra meanings relate to infinite energy, spirituality, supreme Divine wisdom and spiritual compassion. Those who have developed certain spiritual gifts, may utilize the soul star chakra, and gain access to the Akashic records. This access may allow your conscious mind to breach the veil of amnesia, which has prevented you from knowing information about past lives and the lessons learned during them. Although many of the soul star chakra stones are readily available, some of the stones in the following chart are not as common, and will need to be looked for in specialty crystal shops. 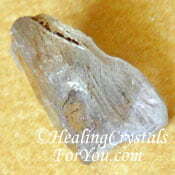 Before working with these higher vibration crystals, I always suggest aligning your chakras first, with Kyanite. 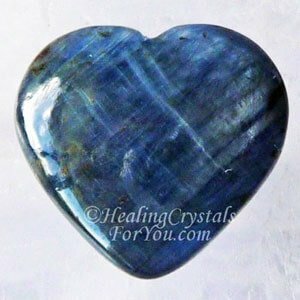 Indigo Kyanite primarily relates to the higher chakras, and is an excellent stone to use at any of the chakras from the third eye up into the transpersonal chakras. 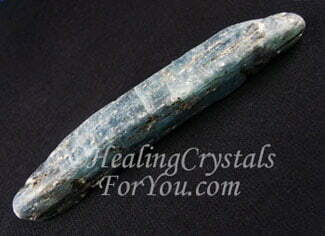 All colors of Kyanite have a strong, powerful vibration, and will bridge any energy gaps. Before beginning any further development work, ensure you have taken care of this first, by aligning your chakras using Kyanite. 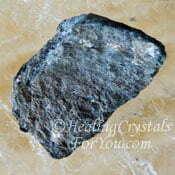 Blue Kyanite is also very powerful for aligning your chakras very quickly. During your life many of you have had accidents or surgery, and are unaware that these may cause gaps in your energy flow. 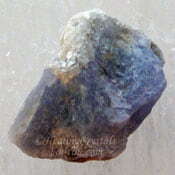 Continue to use Kyanite regularly, once you decide to work with the energy of the transpersonal chakras. This is an important stone to use when doing energy work anywhere in the body, not just spiritual work. It is one stone that is said to never need cleansing, but I still do cleanse mine. 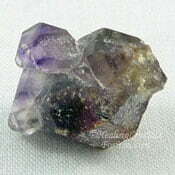 The chakra color of soul star chakra stones may be white, and are also associated with the white ray. 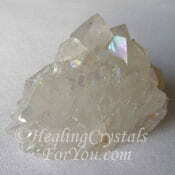 White light may be generated from this chakra, the clear, luminous light which brings spiritual cleansing and healing. 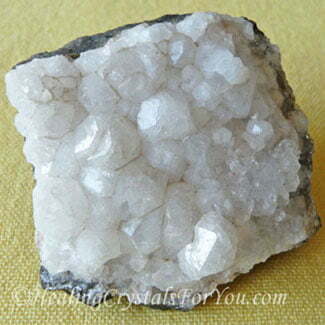 If you have not previously done any spiritual development work, I suggest that you use either Clear Quartz Crystals, Natrolite, Selenite or Clear Danburite. These stones will develop both the eighth chakra and lower chakras. 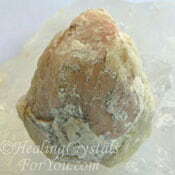 Another very powerful stone to aid the eighth chakra is Phenacite. It will assist white light from spirit, to flow down from the etheric and through the entire body. 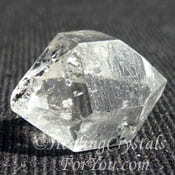 You may notice that many of the soul star chakra stones or crystals are not white, the specific chakra color. Many of these are high vibration stones, that are powerful for bringing enlightenment and amazing spiritual development. Other colored crystals are often crystals that work with more than one chakra, and they may even be chakra stones for quite a few of the chakras. 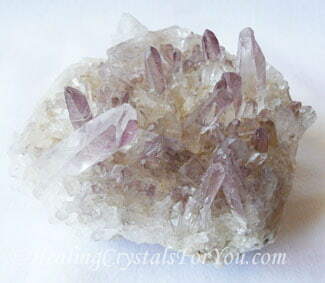 This includes crystals such as Danburite, Herderite, Natrolite, Petalite, Satyaloka Quartz, Sugilite, Datolite of any color including white, like the one in the picture, as well as Amethyst Crystals, Charoite, Phenacite or Tanzanite. 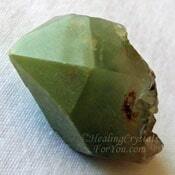 The number of crystals that aid the soul star chakra is quite large, so the list is quite long. You can look at the list of soul star chakra stones at the bottom of the page. It is important when working with the soul star chakra stones, that you are aware of the dynamic energy that this chakra governs. Working on this chakra, you may develop your psychic gifts and find your spirit guides. 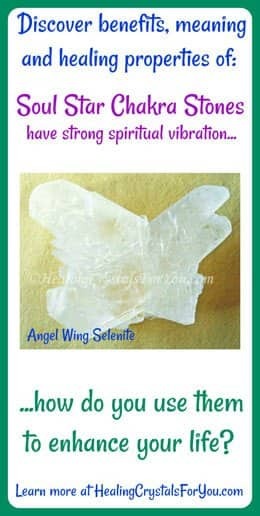 If you have any of the other eighth chakra crystals you may begin working with them first, but Selenite or satin spar, has a high vibration, and many people recommend it. 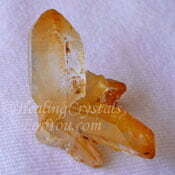 It is often made into healing tools such as Selenite wands. 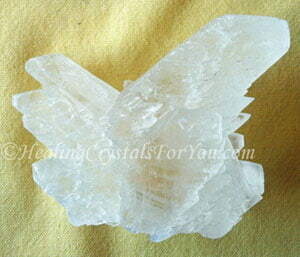 When you begin to work with the eighth chakra, the crystal that is usually recommended is White Selenite. This may aid you to gain access to powerful angelic beings from the higher realms. As you embrace and embody the learning that will come through, amazing changes may happen in your life. It is through this area and via contact with the Ascended Masters, that you are able to activate your lightbody and attain enlightenment. These words should not to be taken lightly, as these higher beings are extraordinarily powerful, and expect a lot from those who choose to make the decision to follow this path. It is recommended that you might like to seek advice from alchemical healers who have the specific knowledge on how this is done. 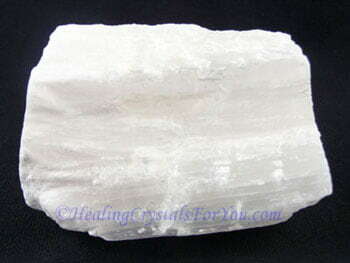 Daily meditation with the powerful high crystal energy stones, including and specifically White Selenite crystals, may open and activate this chakra. Meditating regularly is highly recommended if you want your spiritual path to move more quickly. Depending on your prior experiences, including those in past lives, this will happen at the pace of your own souls journey. Working at the level of the transpersonal chakras, it is very easy to become ungrounded. I highly recommend that you ensure that you are grounded, by the use of spiritual grounding techniques, including doing a grounding meditation. In addition, you may prefer to wear some of the soul star chakra stones as crystal jewelry, such as crystal pendants or earrings. 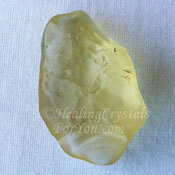 Keeping the energy of these stones within your aura may create spiritual growth even more quickly. 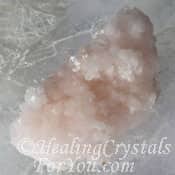 I also strongly suggest that you take steps to protect yourself from psychic attack, and use psychic protection crystals to assist you in this. 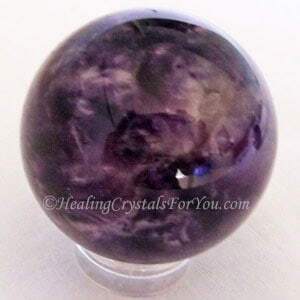 Many of the powerful stones for this chakra, make lovely jewelry and one that is particularly useful to wear as crystal jewelry is purple Charoite. 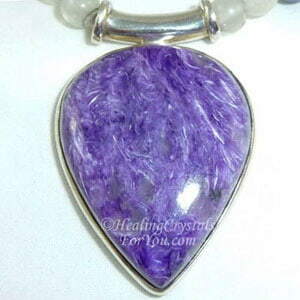 Wearing Charoite stone jewelry is a powerful asset for both psychic protection and for spiritual grounding, and as well they are beautiful crystals. 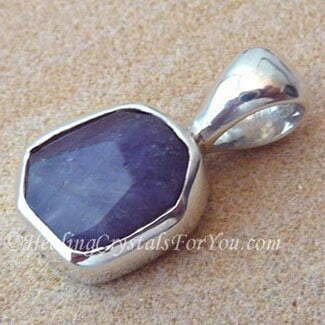 Wearing Charoite has the added advantage of aiding you to 'be of service'. 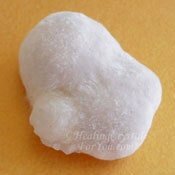 High crystal energy stones worn continuously are very powerful, so if you are going to wear or use high vibration crystals, just ensure that you also wear grounding stones as well. 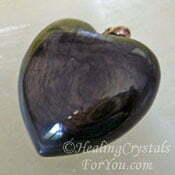 Ensure that you keep grounding stones such as Black Tourmaline or Charoite close by, and if possible within your aura. 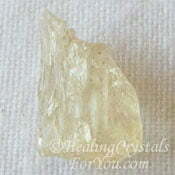 At all times, try to use natural crystals of any crystal if you are able to, rather than manufactured stones. Working with the high vibrations of the transpersonal chakras, you will in all probability begin developing psychic abilities. All psychic gifts can be developed, but it may take time and effort. Once you have begun the process of connecting your soul to your conscious mind, you may gain an awareness of your soul's purpose, and access to karmic memories. The soul star chakra or eighth chakra is the area within the etheric body, where the functions of higher consciousness, spirituality and your commitment to higher ideals originate. 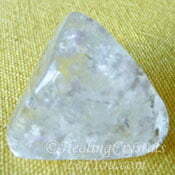 The white ray energy of the eighth chakra is a powerful restorative. It will aid emotional balancing and stability, and bring deep inner peace and tranquility. By the access to Divine Wisdom you may become aware of the oneness of all that is. The eighth chakra is a chakra that is about ascension and your spiritual self. As you work with your higher self and your spirit guides, you may learn why you are here, and why you were born at this time. Many of you who have come onto the earth have a definite purpose. Although you may not know yet what your purpose is, once you work with the high vibration transpersonal chakras, you may gain the knowledge about why you have incarnated. This helps you to be able to follow the path required, and be of service to humanity and the earth. 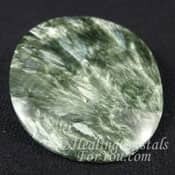 The use of soul star chakra stones has a strong potential to bring through a number of psychic abilities, such as clairvoyance, clairaudience and psychic knowing, and may assist you to develop your intuition. "Do not be frightened or bewildered by the luminous, brilliant, very sharp and clear light of supreme wisdom." Tibetan Book of the Dead. Melody's Encyclopedia, Love Is In The Earth, is a book that covers more than most. This book gives you so much information, and covers so many crystals that on its own is almost a reference library. If you wish to read my reviews of Crystal Books Click Here. While there are pictures of many of the stones that support this chakra, there were too many to be able to show pictures of all of them above. 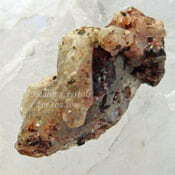 Other stones that also stimulate this chakra include the following... A to E: Ajoite, Amblygonite, Amegreen, Angel Phantom Quartz aka Amphibole Quartz, Angel Aura Danburite, Angel Aura Quartz, Aragonite Star Clusters, Ascension Stones, Astrophyllite, Bertrandite aka Tiffany Stone, Blizzard Stone aka Gabbro, Boji Stone, Brandberg Quartz aka Brandenberg Quartz, Brookite, Cassiterite, Celestite, Celestial Quartz aka Candle Quartz and as Atlantean Lovestars, Chrysanthemum Stone, Clear Apophyllite, Creedite, Cryolite, Diamond, Elestial Quartz and Epidote. Soul Star Chakra Stones G-Z: Glendonite, Golden Rutilated Quartz, Goshenite, Green Ridge Quartz, Hemimorphite, Herderite, Heulandite, Himalayan Gold Quartz, Holley Blue Agate, Khutnohorite, Labradorite, Lemurian Seed Crystals, Merkabite Calcite, Natrolite, Nirvana Quartz aka Lemurian Scalar Quartz, Papagoite, Petalite, Phenacite, Phosphosiderite, Prophecy Stone, Que Sera Crystals, Rainbow Mayanite, Satyaloka Quartz, Shamanite Black Calcite, Star Hollandite Quartz, Stibnite, Sugilite, Tanzanite, Tanzan Aura Quartz, Tourmilated Quartz, Tremolite, Ussingite, White Aventurine, White Topaz aka Silver Topaz, Yttrium Fluorite aka Lavender Fluorite and Zircon. 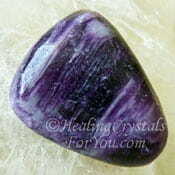 Want To Find Out More About The Crystals For This Chakra? 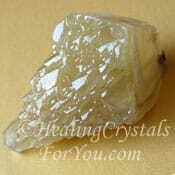 A large number of the crystals on this page have had an in-depth article written about them. 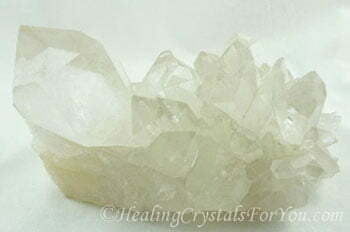 Want to discover more information about any of these crystal's attributes? 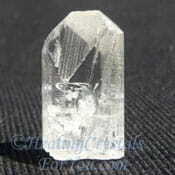 Did you know that its easy to find out if a specific crystal has been written about on an individual page on this site?